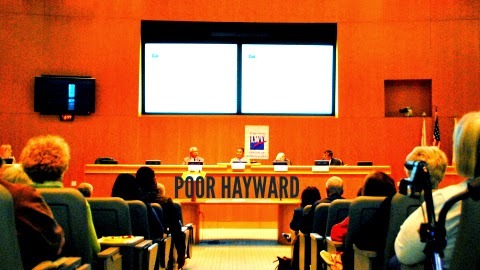 HAYWARD | MAYOR | In Hayward’s even mayoral campaign, the potential front runner, Councilmember Barbara Halliday, may have given her two main challengers a significant sound bite to use against her this June when she said Hayward will never be a wealthy city. Posted in Barbara Halliday, Francisco Zermeno, Hayward, Hayward mayor, June primary, Mark Salinas, Palo Alto, wealthy cities. Bookmark the permalink. Barbara is right. Hayward has many 60+ year single family homes and poorly built apts. If you want to and can afford to live in a very rich, almost white community, you should move to Danville or Piedmont. 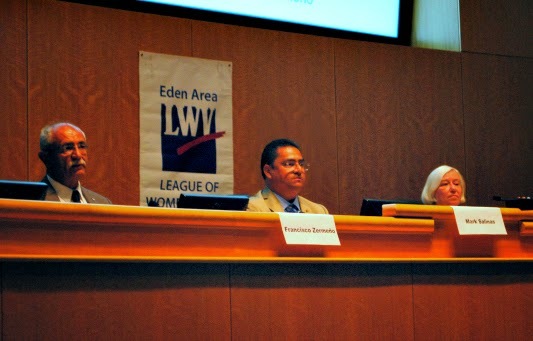 Mark and Francisco could be the first Latinos in Piedmont! Show Hayward's heart by fining the homeless for “outdoor camping” and imake it more difficult for others to offer food to the homeless. Imposing on the lowest paid City Workers, that's not showing heart. She may be an editor's best choice for mayor, but she's disrespected the entire city of Haywaard. At least Mayor Mike restricts his insults to the poorer parts of town. No, Halliday got it right. Hayward is a depressed, dirty, and lowly community. Just saying. Will never be anything else other than a lowerclass stepsister, so the sooner that's accepted the better. She said Hayward would never be rich, like Piedmont. She didn't say it was a diepressed, dirty, lowly place–but she probably thinks it is. Why would she want to run a city like that? Could it be because Munchkinland already has a mayor and Hayward is her second choice? Barbara got it right. Always best to say what you seen in the mirror, not what you'd like to see. I'd bet if she wins, she'll raise the mayor's salary to match what the mayor of Piedmont makes. Hayward has an identity crisis already. The council can't decide if it is Stockton or Detroit. Vote for Halliday if you want Hayward to keep failing & continue being the laughing stock of the Bay. While it is certainly possible that with a combination of hard work, intelligent policies, and good luck that things could get somewhat better in Hayward than they are now, however the probability that anytime in the foreseeable future Hayward will supersede such places as Danville and San Ramon is so extremely remote, that therefore any candidate who says he actually thinks that is likely to happen is obviously extremely stupid and/or a pathological liar. While I myself do not live in Hayward, Danville, or San Ramon, however simply due to my financial situation, therefore if for some reason I was forced to sell my present house and also told that the only three places I was allowed to buy a replacement residence were Hayward, Danville, and San Ramon I would then buy in Hayward, however it would simply be due to the fact that housing is considerably less expensive in Hayward than in Danville and San Ramon. However on the remote chance that someone offered me a house rent free in any of the above towns, obviously I would choose San Ramon or Danville rather than Hayward, and as Salinas and Zermeno also almost certainly would also, and regardless of any demagoguery that they might engage in to the contrary in an attempt to win the present election. In fact, and just as drivers suspected of being drunk can be hooked up to a breathalyzer to determine their blood alcohol level, it's a shame that big windbag politicians cannot be hooked up to a machine that would determine if they are lying. In fact if the typical politician was hooked up to such a machine, the machine would not merely state that the politician was lying, but in fact being exposed to the politician's extreme lies, garbage, and nonsense would probably cause the machine to jump up and down, set new world records in the high jump, broad jump, and triple jump, and then blow up in an explosion so big that it would be heard hundreds of miles away. In short what she said is about things that cannot be said about somethings not well said and for everything to be said of can be said will not matter to be said. I hope that is clear. I say vote for none of the above. Very dumb thing for a candidate to say! I'll never vote for Barbara for Mayor! The problem is the other 2 viable candidates are almost as bad. Salinas seems to have a temper and appears arrogant at times, while Francisco isn't the brightest. I might vote for Zermeno though because he at least seems optimistic about Hayward and would be Hayward's best salesperson to bring business to our city. Better to be honest. Hayward won't be Piedmont or Palo Alto, but it can be a unique city of good, hard working people that just want a viable downtown and a reduction in taxes, not more, which can only happen with new businesses. Wee don't need a rah rah Mayor, we one to change the culture here to business growth. Enough with the housing, get businesses. Barbara Halliday's statement was stupid, stupid, stupid. You don't put down the city you want to be Mayor of…..you build up it's strong points otherwise businesses will never come here. The entire council is stupid and so are all the candidates for mayor and council of Hayward for supporting Measure C. No brains in Hayward. Vote for none of the above. Zermeno has my vote! He is honest, hardworking, and understands the importance of raising a family and supporting higher education! He has proven that he cares about the city over and over again. He is also a scholarship donor, a community activist, college professor, and a bilingual leader. By electing him into office, we can address the needs and concerns of the diverse population in Hayward and create change in the heart of the bay. Barbara is just another cold-hearted white woman who may speak the truth but has no connection to the Hispanic population in Hayward. She has no optimism and hence, cannot offer us any positive outcomes if elected. Zermeno is the one with outstanding ideas, the creativity and intellect needed to get things done and has a long term connection with the Hispanic community but no one else. He is the perfect candidate for Hayward. Please Salinas stop the big ugly sign campaign that's littering yards and streets all over Hayward. They look like graffiti. I would like to see the ebcitizen do some research on Measure C. Compare the Oakland Tribune's editorial, Rebecca Parr's reports and Larry Johman's http://www.HeyHayward.com website on this issue. There are a lot of questions that need answers. Agree. What is the aircraft exemption? Why is the Hayward airport being exempted from the sales tax? There is alot to say about this piece. When a person doesnt have faith in ones city that they are elected in it just shows lack of ideas and lack of leadership. Hayward has the Potential to be any of the great cities surrounding us or even better. It all starts with the council, then the planning department and then the City Manager. Maybe all of the above should be fired and then we start all over. We need to have district council people not a general council. Who do you blame when one sector is almost abandoned and another sector is vibrant? We dont have a council who is accountable. Nor Responsible. You have to have passion for your city, you can not keep taxing those who dont have expendable income. We needed to have that mervyns lots turned into homes. We need fresh blood in our city. Hayward can be the best , but we must stop it with all of this recteric about we cant do anything. We also need to have our general elections in November not in June. Voter turn out in June is terrible and you have the same retired voters. They vote in droves but they do not have the money to grow the city. We need to target those who are working and who have expendable income.